Dropbox is one of the best cloud service to save you important files on cloud storage. There are lots of addon which allows you to manage your Dropbox account such as save your wordpress backup on Dropbox, Listen Music files directly from Dropbox and lots more. Today we found a new web app called Send to Dropbox, a nice way to send you attachment to your dropboix folder from your email directly. No need to download those files on your desktop and upload them into your Dropbox account. One of the best web application to upload files to your Dropbox from your Email account. 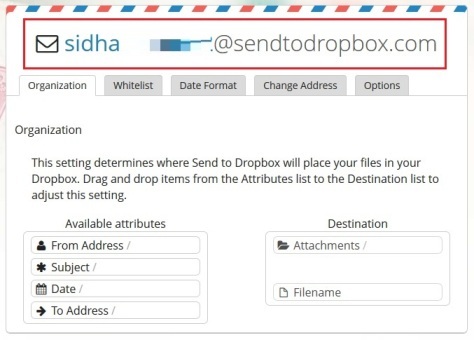 With this free web service you can save your email attachments directly to your Dropbox. All you have to send an email with attachments to a unique email address provided by the Send to Dropbox website to upload files on your Dropbox folder. As we mention above the web app is free ti use and no need to create account with the application, all you hvae to visit the web app link Send to Dropbox from here. On the web page you can found a Green button “Connect to Dropbox“. Hit the button and connect your dropbox account with the application, login with your Dropbox username and Password. Once the account is connected with your dropbox, you can get the a unique email address from the web application. You hvae to save that email address, use the same email ID to send your important file to your Dropbox folder from your email account. Now when you want to send the copy of email attachments to Dropbox, forward that email to your Send to dropbox unique email address. 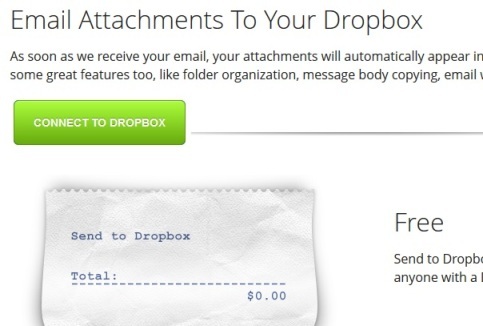 It will automatically send the attachments to your Dropbox. And you can see the same attachments on your Dropbox account. From the setting menu of the web app you can change your unique email adders as per your requirement. Enable options to automatically extract ZIP archive attachments and to send ZIP archive files directly, overwrite the files and more. A nice and easy to use web application to send your email attachment directly to your dropbox folder without opening the dropbox account on your desktop.